America&apos;s fondness for candy isn&apos;t limited to the occasional doctor&apos;s office lollipop or last-minute Snickers bar when pressed for time. No, this country has a serious candy habit. Collectively, the country has an extreme, not-reserved-for-special-occasions sweet tooth that adds up to a startling statistic: The average American consumes 22 pounds of candy every year, the U.S. Census Bureau revealed in a recent press release, citing Life in the USA, a website run by food writer Elliot Essman. Twenty-two pounds? That&apos;s equivalent to eating 234 standard, 1.5-ounce Kit Kat bars, or 451 individual, .78-ounce boxes of Mike and Ike. Want another way to picture it? Imagine the size of two 11-pound newborns. Consuming two babies-worth of candy is kind of a lot, no? 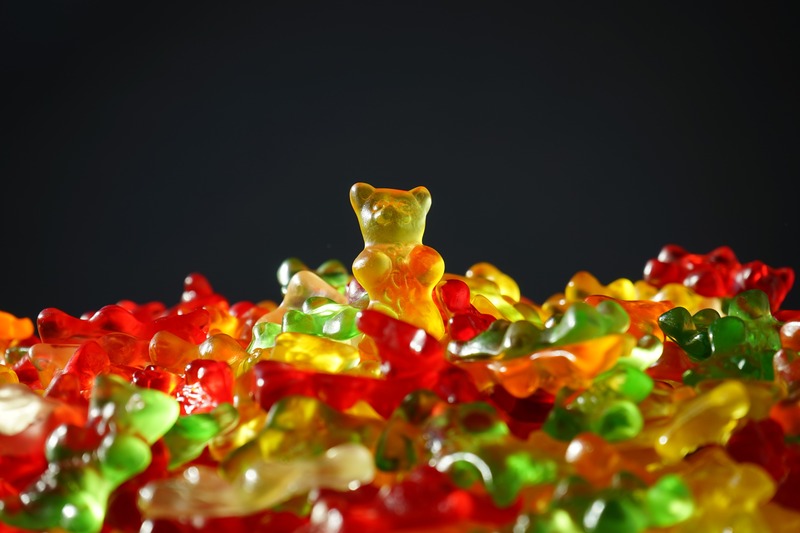 Though, a study abstract published by the FASEB Journal — the journal of the Federation of American Societies for Experimental Biology — in April estimated Americans aged 2 and older each eat about 9 grams of candy per day. The National Confectioners Association, a trade organization representing the confections industry, supported the study, which analyzed government-collected data from the What We Eat in America, National Health and Nutrition Examination Survey for 2009 to 2012. Twenty-two pounds is indeed a lot of candy, but a number of European countries actually consume more. "The average Brit, Swiss or German will each eat around 11 kilograms (24 pounds) of chocolate a year," CNN reported in 2012. That number doesn&apos;t include other candies like Haribo gummies, Skittles and other non-chocolate delicacies. Comparatively, the average American tends to consume a modest 11 pounds of chocolate per year — plus an additional 11 pounds of other candy varieties, according to Life in the USA. But this isn&apos;t an eating contest. The stat is more alarming for the consequences it can carry: Researchers have linked high sugar consumption with risks for diabetes, obesity and heart disease. The food&apos;s been labeled a drug by many, and its addictive qualities — that experts liken to that of cocaine — read pretty seriously when you consider the ingredient lurks in the most unexpected places. Not even salad dressing is safe. So even if you&apos;re not a statistic in these findings, chances are you&apos;re eating more of the sweet stuff than you think. There&apos;s a sliver lining to all of these sugar shenanigans, if you stretch really hard. According to the Census Bureau, "There are more than 56,000 Americans employed in manufacturing sweets and treats." From that information, you could justify that your candy habit is just you doing your part for the good of the economy, right? June 14, 2016, 5:31 p.m. Eastern: This story has been updated to include the National Confectioners Association-supported data published by the FASEB Journal, which differs from the data the Census Bureau cited in its press release.